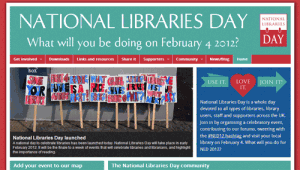 We’re very proud here at Onlineability to unveil our latest web project – producing a website for the National Libraries Day event on February 4 2012. National Libraries Day is a day devoted to promoting the work of libraries in all sectors, including public, school, academic, business or special collections, as well as being a nationwide celebration of libraries, librarians and library staff. It is backed by a host of national organisations including the Chartered Institute for Library and Information Professionals, the National Literacy Trust, the Reading Agency, the Women’s Institute and the School Library Association. Our brief was to produce a strong call to action – a site that would encourage people to organise and join in with local events as well as sharing details of National Library Day through as many social media channels as possible. It needed to be colourful and engaging with lots of clear signposts showing how people could get involved. The finished site therefore includes a range of interactive features including integration with Twitter and Facebook, a Google map for people to add their events and find out what’s happening near them as well as dedicated YouTube and Flickr pages. It also uses the BuddyPress community platform to add features such as groups, forums and a way for users to make friends and keep track of their activity. Onlineability director Lisa Hutchins said: “National Libraries Day is an event very close to our hearts. As people working in an information profession ourselves we know just how under-appreciated librarians and library staff can be. “They do magnificent work helping people get the information and resources they need and, very often, their work is so seamless and efficient that people don’t notice just how important a contribution they make.  If you’re a library user in North Herts or Stevenage, don’t forget to check out We Heart Libraries, a campaign to celebrate and champion the public libraries in our area. Filed under Events and happenings, Things we've done and tagged with BuddyPress, libraries, National Libraries Day, social media, WordPress.